I currently am working with 4 schools with about 10 XO Laptops in each school. I want to add more computers to these schools this year. I have a choice. I can buy more XO Laptops or I can buy the new XO Tablet. Which do you think is best? We have made progress with the XO Laptop and I have an upcoming appointment with the Ministry. My response was quite simple and quick: do not waste another penny or minute buying more XO Laptops. They were cutting edge in 2007. They were still cool in 2009. But today the hardware looks dated and without a touchscreen, oh so limiting. Worse, the XO Laptop never came with any decent software (OS or applications) or content - you always had to hand code your own programs and go begging for ebooks and reference materials. The XO Tablet solves all three major problems with the XO Laptop. First, it is standardized hardware - tried, tested, and usable around the world. Next, it has over 160 software applications preloaded and you can add more via Google Play store. Finally, it has hundreds of books already stored on the computer, ready for use on day 1. Seriously, I cannot think of a single reason to invest in the XO Laptop - unless you already have an install base of hundreds, thousands, or hundreds of thousands of laptops that still need servicing and replacement. The XO Tablet is that much better. And now its available for worldwide shipping on eBay. Sorry to inform you, but the current XO laptop (XO-4) does have a touchscreen. And it is much more robust than a tablet. Yes, and XO-4, if you can get them, still comes with buggy Sugar and the handful of apps that run on it. An educational desert when compared with the XO Tablet apps and content cornucopia. Wayan, I am sure X0 tablets and laptop can co-exist in a deployment. Even though I have no access to a XO tablet or XO-4 touch but I am sure they both good learning devices that will meet different needs. Of course the XO Laptop and Tablet could co-exist, but why would someone add any more laptops when the tablets are so much better? "Plan Ceibal has been one of the early adopters of the OLPC laptop, and Uruguay is the first country to have deployed and reached one-to-one laptop student and teacher saturation. We are very aware of the importance of integrating pedagogy and technology to enrich the educational experience of our children," said Uruguayan government official, Miguel Brechner. "The engaging and intuitive nature of touch-screen technology, as well as the way OLPC has presented the contents of the tablet, will enable us to connect students and broaden their cognitive opportunities at an even younger age." I can see your 2-toddler-based enthusiasm about the XOtablet, but *recommending* it to a school is a bit irresponsible given that you did not use it, you do not know what it can and can not do in and out of a school setting and have no idea what your requestor wants to do with the laptops/tablets. Although the XOtablet can be excellent in a single-user/home setting, I can see few issues in a school setting. Free (as no-cost) software (if not already included in the tablet). Also coming to the Laptop software, sure Sugar is in a perennial beta but has some pretty nice school-oriented apps. From measuring distance, to measuring voltage, to adding external sensors, to controlling a robot to… a bunch of school oriented activities for K-12 (and not preschoolers only as the Uruguay selection of XOtablets indicates). So again, I can understand your enthusiasm for the XOtablet but I would expect a bit more thoroughness before recommending it to a *School*. As JW said XO-4 is touch capable and I can add that it integrates with the other XOs pretty well. And who knows it may even run android sooner rather than latter! - Antitheft: where has this mattered? In the form factor showing its a kid's device, maybe, but never the bricking of the laptop that I know of. So while this is a nice to have, its not needed, and certainly not used by a 10 computer deployment in Africa. Collaboration, Under the tree networking, Outdoors schooling: All these are interesting and make for great photo ops, but the reality is that most action happens inside the school and when outside, tablets like these work well enough. Typing more than 3 lines of text: Is so much easier with an on-screen keyboard than the rubber Laptop ones that got pulled off in 3 minutes or less. Have you forgotten all the photos of trashed laptop keyboards? School server integration (teacher-student communication): is really easy when you just use a browser to go to files on a server - and the tablet browser works wonderfully. The teacher-student communication happens best by just talking to the student, not via electronic means. Printing: Can actually work when using Android, though its rare for printing of any kind to happen in an African schools. They (very) few printers I saw were jealously guarded by principals for their own use. Free (as no-cost) software (if not already included in the tablet): Oh god, if only the Laptops had this, I would've have spend so many years in frustration. The tablet comes with 160 apps pre-loaded, and plenty more (free, even!) in the Google Play Store. Ruggedness: The tablet with the rubber bumper is rugged enough. More than the laptop? That's open to debate - the laptop had a horrible keyboard membrane, and ears would get broken, but it was dropable. The tablets are more compact, no keyboard, but might not survive a kit to the screen (not that the laptops would either). I will agree that the laptops were much, much easier to repair. Collaboration, Under the tree networking, Outdoors schooling: I'm afraid that you hypothesize again, without any data (too close to NN for too long I'm afraid :-)))) These are used quite often. Particular collaboration in games, and the camera in outdoors projects. School server: You declare it useless just because the XOtablet can not work with it yet!?! So again I would expect more thoroughness before recommending to a school. "Of course getting 10 or 20 XO-4s is another story…"
Isn't it always? And for me that's a key issue. The questioner wasn't getting XO-4, they had the choice of XO-1 and XO Tablet. I could, possibly, maybe see where the XO-4 might be better, but only if there was significant investment in Sugar-based software and content that was relevant to the schools and an equal investment in teacher training around it. 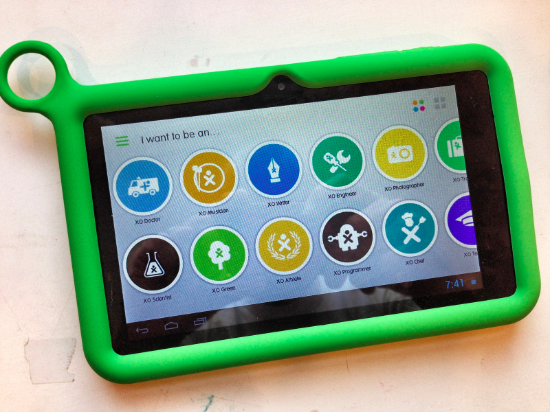 A good case is OLPC Australia which is still only focused on XO-4. For them, it makes sense - they have a critical mass of XO-4 hardware, they've spend hundreds of hours on developing good software and content that works for them, and they invested in teacher training around the XO-4. More XO-4's fit in easy to their existing model, letting them focus on the hard part of education, while the XO tablet would be disruptive without much added value at this point. But if you have a handful of computers (or none at all) adding XO Computers (regardless of model) is going to be way more trouble than they're worth, especially when XO Tablets are better, cheaper, and you can buy them off Amazon anytime, at whatever quantity you want. You can buy anything you want from Amazon, but is it what you need? The XOtablet may very well be it, but I wouldn't know before I have a description of the needs to be covered. Isn't it what OLPCnews was advocating all this time? I may have a decent understaning of the needs of a rural African classroom. I spent 8 years designing ICT solutions for rural and underserved African classrooms, advising people just like the questioner on what would work or not. And beyond classrooms, ICT systems for everything from radio stations to cyber cafes. I also followed OLPC on a daily basis for 6 years. I've seen more failed ICT implementations than I care to remember. Could the XO Tablet fail in a classroom? Of course, but with a much lower probability than an XO Laptop. Right, but as we always ask OLPC, how do we know that any of this advice, design, implementation was good. Any data associated with them? Any of these had tablets? Any first hand experience from any school with tablets? And more general. Tablets are in schools a couple of years max. No data associated with them what so ever. How can anyone declare them better or worse than laptops. Any tablet, and any laptop. Wouldn't it be more reasonable to demand OLPC org to run the new Dreams OS on XO-4? To me, familiar formfactor and addition of keyboard means huge gain for the education market. Before thinking of the device, you need to know the purpose of the deployment. If you want to develop cognitive skills, or develop critical thinking, mathematical logic, programming and XXI century skills, the XO is a good tool, in my opinion, sugar is the best software for doing that (despite software bugs...) Sugar allows to develop these skills, but if you are going to work with children between 4-10 years and you want the child explore his/her abilities, discover her/his talent, and be familiar with technology, maybe the tablet could be better. Other important point to check is energy consumption and technical support. Tablet guarantee works in USA, but in Africa? In my opinion, I think that repair an XO is easy and sustainable in a deployment in rural or remote areas. Both are good devices, but every one has a different purpose. I am still waiting for an African primary school teacher to say, "my goal is to teach programming." Basic literacy, maths, science, and history would be so much higher on the list. It's only those who do software programming who think it belongs in primary schools. your passion for this topic is clear but as a neutral observer I question your logic. Why don't you replace the word African with Western. Equally so you could relace the words 'software programming' with just about anything constructive, example jazz guitar, brick laying or game design. I get the feeling that OLPC is not about replicating western education in the most troubled parts of the world but more about saying what is wrong with our current systems of education that let such problems go on unsolved and how can we try to make it better, the optional word being try or attempt. Why the XO Tablet Is Not a Good Choice for Schools and Developing Countries http://bit.ly/1cnzo4G #olpc"
However the link does not exist. Did somebody hacked the olpcnews twitter account? No, just a publishing time error. You'll see that post go live in about an hour's time. Just hours from returning - this time a two-week mission (partnership) trip to Njoro, Kenya, orphans and vulnerable children. Since our team of fifteen left on August 4 and the Tablet was not actually available before August 6, we did take one classic G1 G1 XO with the very latest re-flash and demonstrated it, leaving the one OLPC at Orphans and Vulnerable Children programme.